In the town of Arauco in the La Rioja province of Argentina stands the oldest olive tree in the country, planted in the 1600s. Although not native to Argentina, the Arauco olive is highly prized for its buttery smoothness and meaty texture, and for the robust floral and fruity flavor notes it contributes to olive oil. 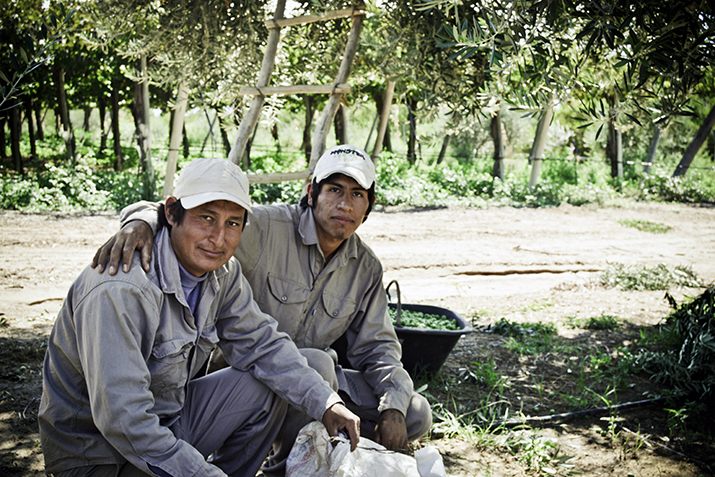 There, in the Antinaco-Los Colorados Valley, the cooperative producers of Riojana extra virgin, fair trade organic olive oil are cultivating much more than their 350 olive trees. Through cooperation, they are growing a healthy, vibrant and sustainable community. La Riojana’s founders came from Italy to Argentina in the 1940s and began cultivating grapes for the production of wine, and planting olive trees as a natural companion plant. Certified fair trade by Fairtrade International in 2006, the members of the cooperative have invested more than $11 million Argentinian pesos (~ $730,000 US), primarily from the sale of their fair trade organic wines, in projects including a new drinking water supply for the village of Tilimuqui, where many of La Riojana’s workers and their families live. The fair trade premium has also been invested in production improvements, new community centers and medical equipment, but the most visible result of the cooperative’s reinvestment in its farmer members and their families can be seen in their commitment to education. Check out this video to hear directly from members of the La Riojana co-op and their local community as well as from food co-ops supporting La Riojana through sales of its delicious, fair trade products.